Over the past 4 months since my previous post, in November last year, in which I spoke about changes to the layout of the vegetable garden, the plot has undergone some more design changes. For the past few years, one quarter of the vegetable garden that is accessible to visitors here at Sissinghurst Castle has been dedicated to edible and medicinal herbs which are useful to both the chefs in the kitchen but also in attracting pollinating insects into our vegetable patch. Although very attractive in the early summer months, this herb garden was very high maintenance and was not a particularly productive part of the vegetable garden. All of the fruit that we grow here (for example raspberries, blackberries, blackcurrants, rhubarb and loganberries) is grown outside of the visitor area and I thought that with some changes to the layout of the vegetable garden (specifically the herb garden) we could incorporate both the herbs and soft fruit into one productive, attractive and informative area. I spoke to the chefs to find out which soft fruit and herbs they find particularly useful for use in the kitchen and also used previous records to determine which fruits held high yields in our soil and would be worth growing in the new area. I then drew up a plan of the proposed new fruit and herb garden and discussed with Head Gardener, Troy Smith, how the new design might fit into the old space. By removing some turf to extend the area we would be able to fit in all of the varieties of fruit that we wanted, plus enough herbs to keep the restaurant supplied. The design was finalised at the beginning of October 2014 and deconstruction work in the herb garden began later that month. We first removed all the plants and potted on some that were worth keeping for planting in the new area (for example some fairly young but healthy looking rosemary bushes). We then removed all of the wooden edges that created the raised beds within the herb garden and took up the woodchip and plastic lining from the paths. Using the digger, the excess turf was then removed and the area ‘raked’ using the digger bucket to reduce some of the compaction, especially in areas which had previously been pathways. …followed by the plastic lining. Finally the digger moves in. 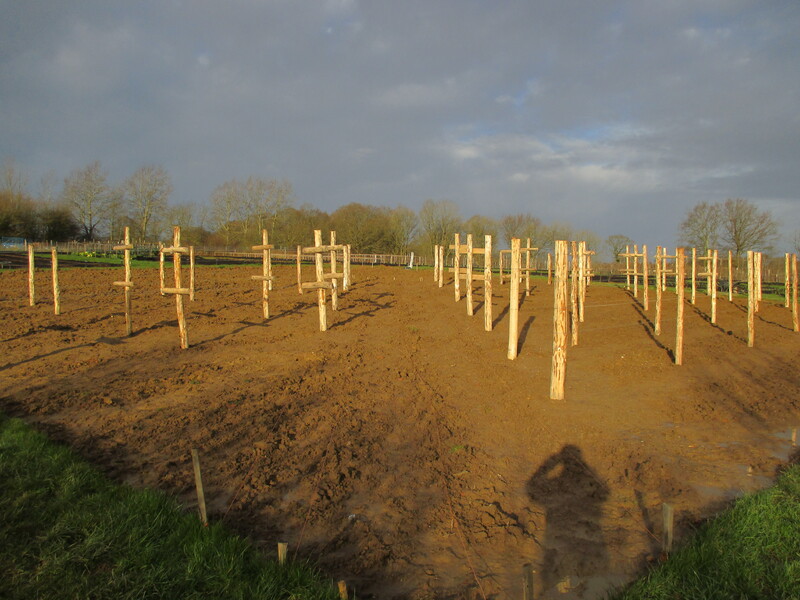 An external fencer was contracted to construct our post and wire supports and he used chestnut for the posts which was coppiced out of woodland on the Sissinghurst Estate. Each type of fruit had a different requirement as to the specification of the wire heights and this had to be carefully researched and drawn up for the contractor to work from. The fruit plants arrived one week after the posts had been set in the ground and the wires put up and we were able to begin planting right away. We have a very heavy clay soil in the vegetable garden so we ensured that we dug sufficiently large holes and incorporated some well-rotted manure into each planting hole. This will improve both the nutrient content of the soil and also the drainage around the roots of the plants. Once all the fruit had been planted we spread a thick layer of manure over each planted row to act as a mulch to suppress weeds and also to enrich the soil further with nutrients. Finally we spread a layer of woodchip over the paths to keep them from becoming too muddy and to suppress weeds. Still to be planted in the new area are a selection of herbs that we are currently growing from seed in the glasshouse. We will plant these out in early spring. It will take a year or so for the fruit plants and herbs to become fully productive, and for the area to bed in, but by next summer it should be looking attractive and producing a plentiful harvest of fresh fruit and herbs. Do pay us a visit here on the vegetable garden this summer to see how it’s coming along.